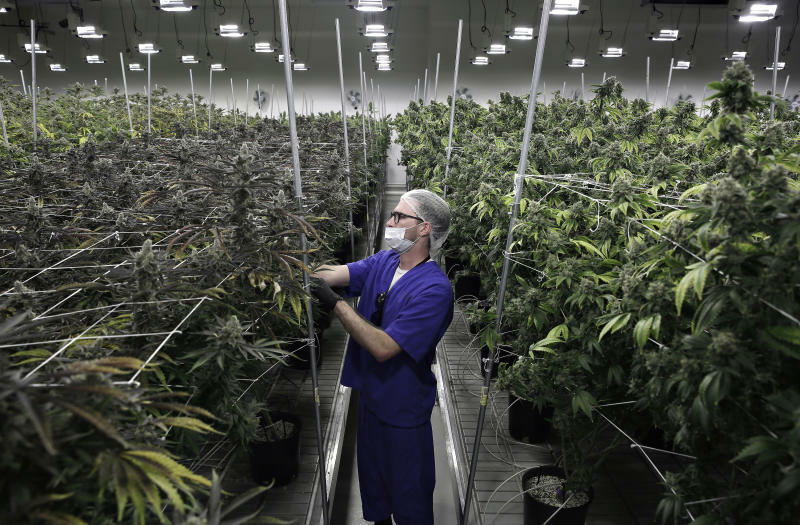 LAS VEGAS (AP) -- The state of Nevada could reap more than $1 billion from marijuana production, processing and robust sales during the first seven years of recreational pot sales, according to an industry group's economic analysis released Friday. Nevada is among nine states and Washington, D.C., that have legalized recreational marijuana. Sales got off to a rocky start amid a legal battle over distribution licenses, and tourists still don't have a place to legally smoke the pot they can buy. Hotels don't allow smoking in rooms, and laws regulating marijuana lounges have not been approved. Smoking also isn't allowed in a Las Vegas museum, named Cannabition, that recently opened to advance Las Vegas toward becoming a marijuana mecca. It features a glass bong taller than a two-story building. Democratic state Sen. Tick Segerblom, the legislative godfather of Nevada's marijuana law, said Friday that lawmakers should allow pot-centered venues ranging from spas to yoga studios to concerts and festivals. "You can't encourage people to come to Nevada to buy marijuana and then say, 'Oh by the way, you can't use it here,'" he told the dispensary association. The economic report said 64 retail dispensaries are now open statewide, with more than half in Las Vegas. The 40 businesses that participated in a survey for the report employed about 1,300 people. The report projected more than 8,000 jobs in the industry in the next six years. It did not look at public safety, health, human services, schools or criminal justice costs associated with legalization. In Washington state, where voters legalized pot in 2012, a 2017 report examined two years of data and found no evidence that recreational sales affected cannabis abuse treatment admissions. It found that adults 21 and older were "significantly" more likely to report heavy cannabis use in parts of the state with high per-capita sales. In Nevada, the report said marijuana cultivation and production is centered in and around Las Vegas, North Las Vegas and Pahrump. It said 99 of 120 licensed marijuana farms and 69 of 83 processing sites are in Clark and Nye counties.